There seems to be a niche cult of Eddie Izzard fans in the world; we're always encountering either one of two types of people. The first type is like, "Eddie who?" And the second type is like, "OMG I CAN QUOTE EVERY SINGLE SHOW!" Either you don't know him, or YOU LOVE HIM. There is no third option. We fall into the latter category. This review is for the former. "I claim India for Britain!" They're going "You can't claim us, we live here! Five hundred million of us!" "Do you have a flag...?" 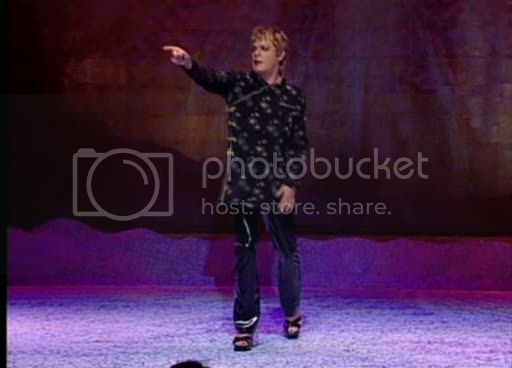 There is something about Eddie Izzard that is eminently quotable: his unique, self-deprecating wit covers vast terrains of science, religion, history and epic-scale ridiculousness - he's perfect for all occasions! And this makes him a rarity, since stand-up comics seem to fall into genres depending on what they mine for laughs: they either go for the humor of daily life (like Jerry Seinfeld), politics (Jon Stewart, Lewis Black), race (Chris Rock, Russell Peters), shock (Denis Leary, George Carlin) and such like. 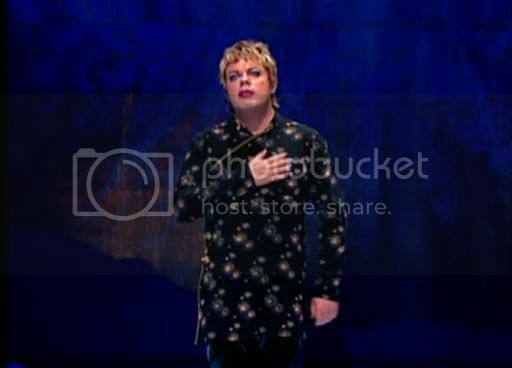 Eddie Izzard breaks the mold by taking what would be boring bourgeoise interests - World War II, film theory, Druids - and bringing them down to the level of the absurd. Everything can and is mocked; subjects from your school Social Sciences curriculum are especially fertile territory. Sometimes called the "Lost Python" by Monty Python members, he shares with them a sense of the ridiculous coupled with a searching intelligence. Nothing is not used as fodder in his shows. Like early Monty Python sketches, he delights in surreal set-ups - Jesus preaching to the dinosaurs, for example - and his jokes don't usually finish with punchlines, so much as they circle around ideas, reflections and bizarre images. Whatever happened to Pavlov's cat, for example? Indeed, you have to pay attention during an Eddie Izzard show, because often he'll unexpectedly bring out earlier ideas in later moments. Of course, it's dead easy to pay attention because he is just captivating. His verbal tics - falsetto hums and remarks such as, "Uh, what was I talking about?" - lend an air of casual stream-of-consciousness, easy-going spontaneity to his stand-up. (This is somewhat staged, given his multi-venue tours.) It feels like spending time with your smart, silly, most imaginative friend. 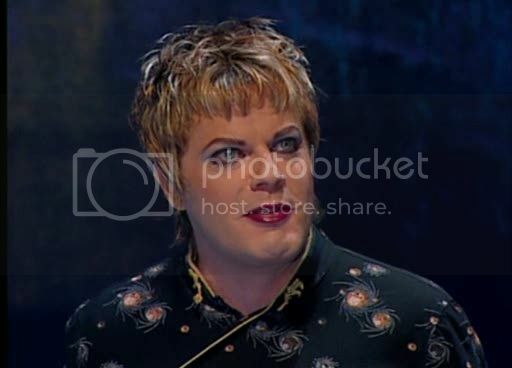 Dress to Kill aired on HBO in 1999 and went on to win Emmy Awards and introduce Izzard to an American audience. Since then, he's become increasingly popular both in the UK and US, eventually migrating to work in films (by his account, his original passion). But you can't do that in Church of England, you can't say, "You must have tea and cake with the Vicar, or you die!" You can't have extreme points of view, you know. The Spanish Inquisition wouldn't have worked with Church of England. "Cake or death?" has since become its own viral phrase - making the rounds at party conversations like a secret password. We at the PPCC became rabid fans of Izzard ever since first seeing this show in 1999, and his quotes and ideas have served us well - at least, they've lightened the most horrible moments (grad school exams) with the most delightful and slightly inappropriate soundbites ("But Jesus was a white man from Oxford!"). 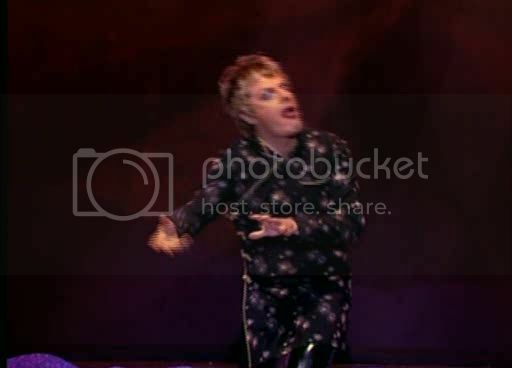 You may not always want to vocalize the Izzard re-run constantly going in your head (we've found it can lead to some very awkward moments indeed) - at least not without context. Hence, we bring the context to the PPCC for future Izzard references: watch this! Love it! You will! We steal all our jokes from him anyway! Oooooh Eddie! I'm going to see him live in Toronto in May and I CANNOT WAIT. "Do you want to get some coffee...with the President of Burundi?"